Paleo diet denotes all the foods content that used to be taken by ancient people before 10000 years ago. These diets include foods that used to gathered through hunting or through gathering processes such as fruits, vegetables, nuts, fish and meats. For staying healthy and fit like ancient people every person must follow the primary lists of the paleo diet. The reason behind the strength, high immunity power and severe diseases free long and healthy life of ancient people was their natural paleo diet intake that they used to take every day. This is the reason now it is medically approved that how healthy these diets are, and how much effective it is to keep someone fit and strong naturally. Now the diet pattern and way of cultivation is completely changed than the previous era and this has thrown a negative impact on the health of all human beings around the world. No one is completely healthy nowadays or since the time when the modern process of cultivation is applied for cultivating the grains, legumes and dairy products. The real cause behind major effect on human health that people are still incapable in adapting the changes of their regular day to day diet as in ancient time they used to rely on purely hunted and gathered natural diets and they were naturally adapted for those diets only. 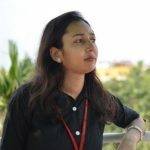 This major changes in the diet pattern in human beings as a whole have caused the birth of some chronic health issues which are very common nowadays such as heart diseases, obesity, diabetes, hypertension etc. So choosing paleo diet in your regular diet list may easily or naturally relive from such common health issues like obesity, diabetes etc. 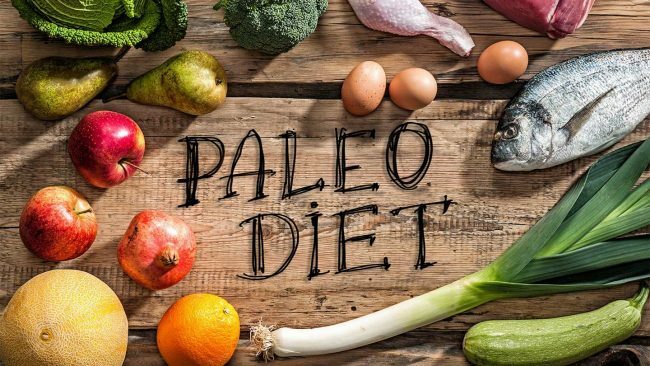 Paleo diet is also known as Stone age diet, Caveman diet, Paleolithic diet, and Hunter-gatherer diet because this diet list belongs from the ancient time when human being used to gather foods from nature by hunting process or by searching. 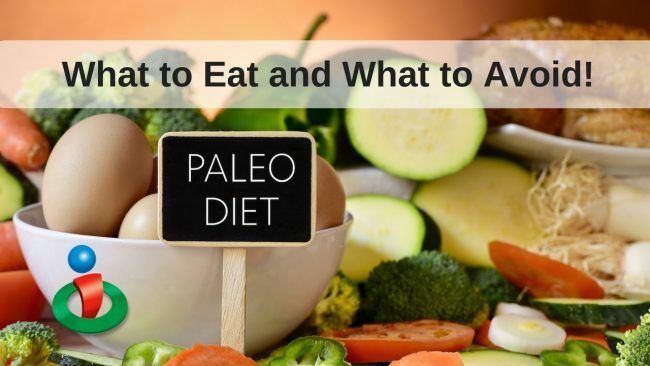 Before discussing the list of paleo diet it’s better to clarify that what paleo diets are eatable and what are those such diet which needed to be avoided so that you can reach complete benefit and fitness by taking those eatable paleo diets. Natural Oils such as avocado, walnut, coconut, macadamia, flaxseed. Generally, all vegetables come under the list of paleo diet list but out of them, some carry more nutritional value whereas some of them carry less nutritional value. Vegetables rich in starch have a very less nutritional value such as squashes and potatoes with a comparison to other vegetables. Some important paleo diet vegetables include Parsley, Cabbage, Cauliflower, Asparagus, Celery, Spinach, Avocado, Carrots, Green onions, Peppers, Eggplant, Zucchini, Brussels sprouts, Artichoke hearts, All type of Peppers etc. Paleo diet fruits are not only delicious by taste but it also carries very high nutritional value which helps to boost your health in several ways. It brings charm to your skin and strengthens your inner health. It is recommended to take the paleo diet fruits which contains fructose instead of medicating syrup for such nutrients. Some primary paleo diet fruits include Grapes, Apple, Mango, Plums, Papaya, Avocado, Lychee, Banana, Figs, Lemon, Oranges, Watermelon, Strawberries, Lime, Cantaloupe, Raspberries, Peaches, Blackberries, Pineapple guava, Tangerine etc. Paleo diets include nuts and seeds too which are all rich source of fat. These dry fruits benefit your entire health and improve your skin quality too by adding natural glow and beauty to it. However, if you want to lose your body weight then don’t focus on consuming the fat-rich nuts and seeds. Some important paleo diet nuts and diets include Pecans, Walnuts, Pine nuts, Cashews, Almonds, Sunflower seeds, Chia seeds, Pine nuts, Pumpkin seeds, Macadamia nuts, Sesame seeds, Hazelnuts etc. Some paleo diets vegetables are quite rich in starch so not good for people who are suffering from obesity and willing to lose their weight. These paleo diet vegetables include Beets, Yam, Sweet potatoes, Acorn squash, and Butternut squash. Almost all meats come under the category of paleo diet meats but not all of them should be eaten especially meats which are rich in fat such as hot dogs, spam and any other low-quality meat must be avoided for the good health. Paleo diet meats that are good for the health include Clams, Bison, Buffalo, Venison steaks, New York steak, Salmon, Shrimp, Lamb rack, Lobster, Lamb rack, Chicken leg, Pork, Chicken breast, Chicken wings, Chicken thigh, Veal, Pork chops, Pork tenderloin, Veal, Steak, Bacon, Turkey, Poultry, Bison sirloin, Bison jerky, Bison ribeye, Bison steaks, Goat, Lamb chops, Rabbit, Emu, Elk, Kangaroo, Goose, Beef jerky, Reindeer, Turtle, Quail, Lean veal, Rattlesnake, Chuck steak, Pheasant, Eggs of duck, goose and chicken. Seafood is another healthy paleo diet which is rich in protein, Vitamin, and minerals. It contains a very low quantity of fat so good for those who are willing to lose body weight or want to maintain a healthy body weight. Some popular paleo diet seafood includes Shrimp, Oysters, Crayfish, Scallops, Crawfish, Lobster, Crab, Clams etc. Fish also comes in the category of the paleo diet. Its Omega3 content makes it essential for health and it works amazingly in improving several severe health conditions. Fish that contains omega 3 and alive are worthy to eat for boosting overall health. Some important paleo diet fish includes Salmon, Tuna, Trout, Walleye, Sardines, Tilapia, Mackerel, Swordfish, Halibut, Sunfish, Bass, Shark, Red snapper etc. Paleo diet fats and oils are obtained from the natural products which are completely safe for eating and plays an important role in boosting health. People especially who are weak by health and needs natural energy for living a healthy life must include these diets in their day to day meal. Some popular paleo diet fats and oils include Ghee, Coconut butter, Avocado oil, Olive oil, Grass-fed butter, Macadamia oil, Coconut oil etc. All these oils and fats are good source of natural energy that improves your immunity system which is very essential to keep you diseases free and for fighting with chronic health concerns. 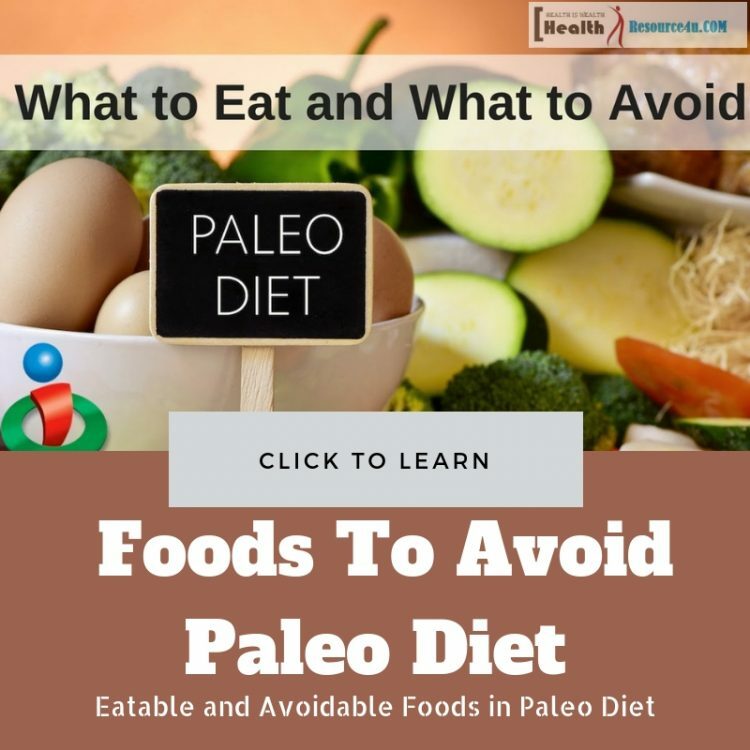 Some other paleo diets that are good for health and not mentioned in the above list are Maca, Apple cider vinegar, Tahini, Cardamom, Cinnamon, Spirulina, Tahini, Coconut aminos etc. There are some foods that must not be included or should not be consumed as the good paleo diet. Avoiding these diets will improve your lifestyle and will also enhance your overall health. Artificial sweeteners are not natural so these not a paleo diet. These are artificially made and must be avoided in a regular diet. Instead of these natural sweeteners like honey, maple syrup etc. should be used for making sweet taste of foods. Most of us rely on medicines and substitute diets for improving our health especially when the aging process starts. However, if you follow simply the paleo diet in your regular life then you don’t have to worry about any major health concerns or about your fitness. 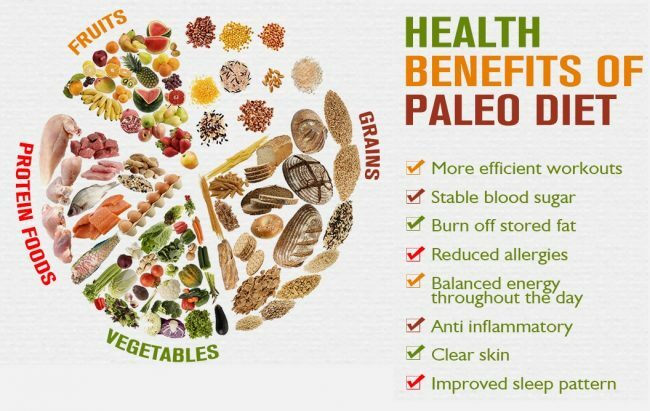 Below we have described some important benefits of the paleo diet for the health. Paleo diets are the good source of healthy fat and protein which is very essential for the growth and development of your brain. Out of all paleo diets, fish which are rich in omega 3 fatty acid is most vital one that carries high-quality protein. Among Omega 3 rich fishes Salmon comes in the first category which often recommended by doctors for improving overall health. Apart from this other sources of omega 3 fatty acid out of paleo diets include pasture raised eggs and meats. Unhealthy diets such as highly processed foods, sugary products, man-made fats etc. cause inflammation in the intestinal tract resulting in a problem in digestion occur which is also known as the gut syndrome. A bad gut health is responsible for other bad health conditions too as because it affects to other functionality of body too so it can cause stress, skin issues, mood swing, autoimmune disease, weak immunity power etc. All these issues can be relieved by taking paleo diet in your regular meal as it helps in improving your gut health. Paleo diet is the best source of protein, especially which derives from the animal’s flesh as it has cell constructive power resulting in the growth of body muscles. The more body muscle you have more energy you will get as it increases the metabolic rate which is essential for providing energy to your muscles. This reduces the issue of extra body fat as along with an increase of muscle cells, bod’s fat cells shrink. Our body cells are consists of saturated and unsaturated fat which works on the principle of appropriate balancing of these two types of fats. When you start consuming paleo diet your cells get a boost and growth as this diet automatically provides a balanced level of fat that directly enhances the body cells. Your body requires a proper level of Vitamins and minerals content for its good functioning and for balancing a good health which can easily be obtained from the rainbow paleo diets. Rainbow means different colors of vegetables seasonal wise as each color denotes for a particular nutrient. So get these vital nutrients by having paleo diet vegetables every day. If you have a digestion issue then you must follow the paleo diet every day to see the difference in your digestion concern with a comparison to your previous diet routine. Though you can improve your digestive capability by following paleo diet still paleo suggest continuing with those diets which you are capable to digest and not causing any concern in your digestion or absorption system. Following the paleo diet in a systematic way you can give a boost to your body’s metabolic rate which is important for keeping you energetic. It is suggested that paleo diet which has low glycemic index are good for your metabolic rate so these should be included in your regular diet. Paleo diet list often suggests avoiding that food or diets that cause allergy and inflammation to you. 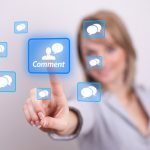 This issue can vary from person to person depending upon their body structure and lifestyle. Like raw milk may cause allergy to many people so this must be avoided for preventing such concerns. Most of the paleo diets are rich with anti-inflammatory properties so these must be included in the regular diets for preventing the inflammation concerns which can give birth to severe diseases such as heart-related problems etc. Omega 3 fatty acids are rich with anti-inflammatory properties so this should be included in your diet plan. We simply suggest you follow our lists of the paleo diet for improving your overall health and for staying fit and strong. If you can rejuvenate your health just by little changing in your regular diet then there is no harm to adhere it as it really worth for you. Amazing list of eatable and avoidable food while following the Paleo diet. This article described various information on Paleo diet which is really crucial to find.